RAMONA (5-1 overall, 1-0 River Valley League) tore into Patriot in the league opener, controlling the point of attack and holding on for a 20-0 shutout victory. Junior Donte Roby took command of the game in the second half, rushing the ball and managing the clock even after senior QB Brandino Osayande went to the sideline after taking a hard hit late in the game. Osayande passed for two touchdowns on the Ram’s first two possessions of the game, and then Roby ran it 14 times in the second half, gaining more than 40 yards and scoring a late touchdown as the Rams killed the clock in the second half. 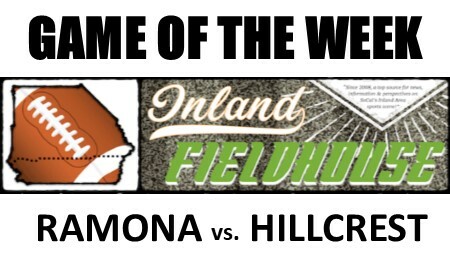 HILLCREST (3-3 overall, 1-0 River Valley League) pummeled Norte Vista for the first time in school history, downing their perennial home-field hosts, 53-14, in Week 6. Sophomore QB Camren Payne had his most efficient performance this season, completing 7 of 10 passes for 202 passes and two touchdowns while rushing for 97 yards and running for two more scores. Sophomore RB Dominique Clay added 112 yards and two TDs as the Trojans dominated both time of possession and total yards. Hillcrest’s young offense will be tested by another strong defense. So just how dominate are the Trojans?